Dublin City Council said it’s investigating the matter. 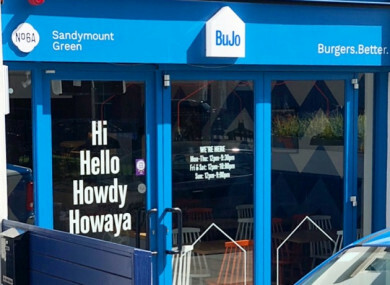 AWARD-WINNING DUBLIN BURGER restaurant BuJo has asked Dublin City Council to overturn a 16-year-old planning rule so it can keep selling food to-go at its Sandymount Green outlet. The firm has applied for retention permission from city planners to give it clearance for “the consumption of food off the subject premises”, which it said would contribute to the “viability of the business”. A restriction first imposed in 2003 in an original application for a duplex apartment over a ground-floor restaurant forbid the operation of a takeaway at the Dublin 4 site. At the time, An Bord Pleanála stated that the original development could go ahead on the condition that “the restaurant shall not provide a ‘take-out’ service … in the interest of residential amenity”. BuJo opened in the space in 2017. In a submission to the council, prepared on its behalf by property advisor RW Nowlan & Associates, the company noted that the “principle uses of a restaurant have changed somewhat” since the early noughties. It stated that a “vast number of restaurants in the Dublin region” operate some kind of “off-premises food consumption”. “The subject restaurant is no exception to this, with the adjoining restaurant operators also trading outside the parameters of the traditional restaurant uses,” it said. Unlike a traditional takeaway shop, BuJo’s submission stated that its food-to-go offering will “blend in with the existing restaurant use” and wouldn’t change how the restaurant looks or currently operates. The crux of Bujo’s argument finds some room for manoeuvre in the restriction imposed in 2003. It stated that the “minor nature” of the takeaway element at the restaurant, the fact that it’s related to the main business and the changes in the wider food industry over the last 16 years mean that “no breach has occurred in the modern sense of restaurant use”. The spokesperson added that “no such decision has been made on this property to date”. Separately in recent weeks, Mexican burrito bar Boojum Boojum sought permission to retain a takeaway at one of its Dublin locations after the council received a complaint alleging that the service is being operated in contravention of planning rules. Email “Burger joint BuJo wants to topple a decade-old planning rule so it can keep selling food to-go”. Feedback on “Burger joint BuJo wants to topple a decade-old planning rule so it can keep selling food to-go”.